Two of the best historical fiction books I’ve read in recent years are Margaret Skea’s Munro Scottish Sagas, Turn of the Tide, and A House Divided, both of which transported me back in time to 16th century Scotland and France, specifically to the world of the feuding clans of Cunninghame and Montgomerie. 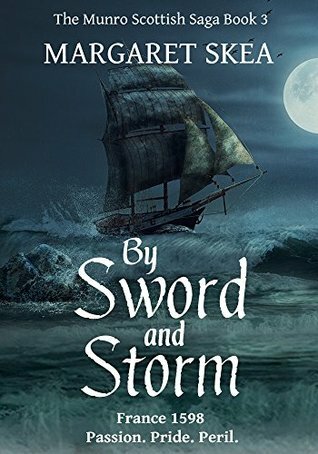 By Sword and Storm is the third book in the Munro Saga. It stands well on its own but I recommend reading the earlier books to get the whole picture of what happened in the years before. It is now 1598 and the Munro family, Adam, his wife, Kate, and children, Robbie, Maggie and Ellie are living in France. Adam and Robbie are in the Scots Gardes, serving Henri IV of France: Adam is a colonel and Robbie is a sergeant. The Scots Gardes were an elite Scottish regiment whose duties included the provision of a personal bodyguard to the French King. The story is well grounded in research and based on historical facts, seamlessly interweaving fact and fiction. It is complex novel with several plot lines, locations and characters, some based on real historical figures and others fictitious, such as the Munro family. There’s a useful list of the main characters and a map at the start of the book and a glossary and historical note at the end. As the story begins the French Wars of Religion are drawing to an end and the Edict of Nantes has established religious freedom, placating the Catholics whilst making concessions to the Huguenots – but not in Paris or at the French court, where Protestants are still banned from openly practising their religion. When Adam saves Henri’s life as a shot is fired from the crowd, he and his family are summoned to live at the French court, despite their religious beliefs. Life in Paris holds many dangers for the Munros, especially for Robbie when he falls in love with a girl from a Huguenot family. Back in Scotland some members of the Cunninghame and Montgomerie factions are still feuding, notably Hugh Montgomerie, the Laird of Braidstane and William, the son of the head of the Cunninghame clan, whilst other clan members try to maintain the peace. James VI has banned duelling but that doesn’t deter Hugh and William. Meanwhile, Hugh’s wife, Elizabeth, pregnant and left on her own in the depths of winter with only her children and a servant for company, faces her own dangers. There is so much to enjoy in this book – first of all the story itself, expertly narrated, full of tension and surprise, and also the characters. But I also loved the personal touches, revealing what life was like in the 16th century, how both ordinary people and royalty lived, and the dangers that faced them in their daily lives, particularly for women in childbirth and sickness and for those who dissented from the established religion. I loved all the details about the French court, in particular about Henri’s mistress and the relationship between her and Kate. As in the earlier books Margaret Skea writes such beautifully descriptive passages, bringing to life the details of the French court and of the landscape in both Scotland and France as well as the dangers of travelling by sea. This is ostensibly the end of the Munro saga – but Margaret Skea has revealed on her blog that she is hoping to revisit the Munro story at a later date. I hope she does, but if not this is an excellent end to the series. I think one of the challenges in writing really engaging historical fiction is that combination of well-researched fact and the story – the fiction. I’m glad that blend worked for you here, Margaret. And it’s such an interesting historical era, too. It’s good to hear you enjoyed it.